My iPhone Doesn’t Vibrate! Here’s The Real Fix. You are at:Home»iPhone»Sounds»My iPhone Doesn’t Vibrate! Here’s The Real Fix. You pull your iPhone out of your pocket and see three missed calls from Grandma. You’re sure you had it set to vibrate, but you couldn’t feel the buzz! Uh-oh—your iPhone stopped vibrating. In this article, I’ll show you how to fix an iPhone that doesn’t vibrate and what to do if the vibration motor is broken. Before we begin, let’s see if your iPhone’s vibration motor is turned on. 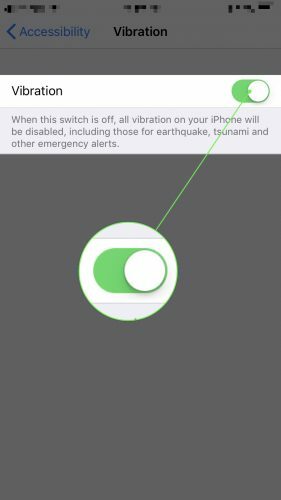 Flip your iPhone’s Silent / Ring switch back and forth (the switch is above the volume buttons on the left side of your iPhone), and you’ll feel a buzz if “Vibrate on Ring” or “Vibrate on Silent” is turned on in Settings. (See the next section for details about how the switch works.) If you don’t feel your iPhone vibrate, it doesn’t mean the vibration motor is broken—it means we need to take a look inside the Settings app. 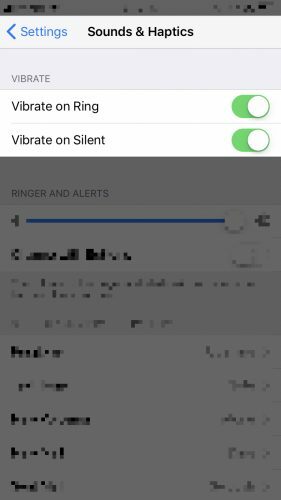 If “Vibrate on Ring” is turned on in Settings, your iPhone will vibrate when you pull the Silent / Ring switch toward the front of your iPhone. 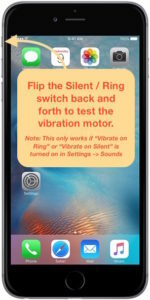 If “Vibrate on Silent” is turned on, your iPhone will vibrate when you push the switch toward the back of your iPhone. If both are turned off, your iPhone won’t vibrate when you flip the switch. A common problem that iPhone users face is that their iPhone doesn’t vibrate in silent mode. Other people’s iPhones won’t vibrate when the ringer is turned on. Fortunately, both of these issues are usually easy to fix inside the Settings app. Open the Settings app, scroll down, and tap Sounds & Haptics. The two settings we’re going to look at are Vibrate on Ring and Vibrate on Silent. The Vibrate on Silent setting will allow your iPhone to vibrate when in silent mode, and Vibrate on Ring setting enables your phone to`ring and vibrate at the same time. Tap the switch on the right-hand side of either setting to turn it on. If Vibration is turned off in your iPhone’s Accessibility settings, your iPhone will not vibrate even if the vibration motor is fully functional. Go to Settings -> General -> Accessibility -> Vibration and make sure the switch next to Vibration is turned on. You’ll know the switch is on when its green. It’s possible that your iPhone doesn’t vibrate because you’ve set your vibration pattern to None. Open the Settings app and tap General -> Sounds & Haptics -> Ringtone and tap Vibration at the top of the screen. Make sure there’s a check mark next to anything other than None! My iPhone Doesn’t Vibrate At All! If your iPhone isn’t vibrating at all, there may be a software problem with your iPhone. One way to fix this is to reset your iPhone’s settings. Doing this won’t erase any content from your device, but it will return all the iPhone’s settings (including vibration) to factory defaults. I strongly recommend backing up your iPhone with iTunes or to iCloud before starting this process. Open the Settings app on your iPhone and tap General. Scroll to the bottom of the menu and tap Reset. Select Reset All Settings and confirm that you’d like to proceed. You’ll need to enter your passcode if you have one. After you do and your iPhone restarts, test your iPhone to see if it vibrates. If it doesn’t, read on. If you’ve tried all of the previous steps and your iPhone doesn’t vibrate, it’s time to backup your iPhone and follow our tutorial on how to DFU restore your iPhone. A DFU restore erases all the content and settings from your device and is the end-all-be-all for fixing iPhone software issues. This is different from a standard iTunes restore as it wipes both the software and hardware settings from your device. First, make a Genius Bar appointment at your local Apple Store. 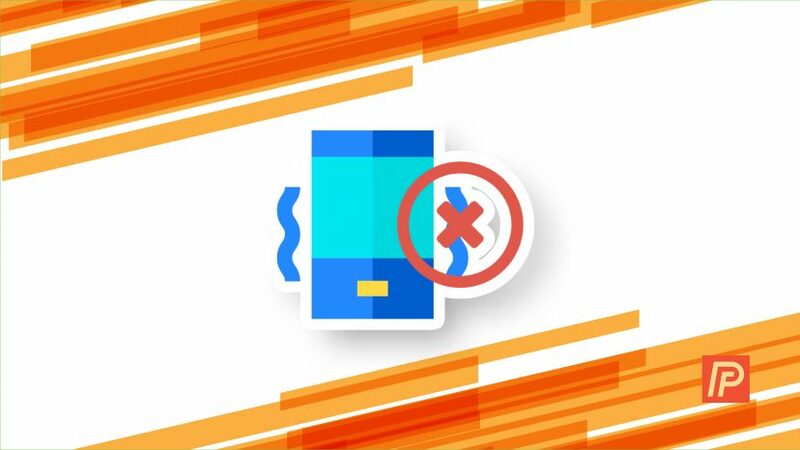 Be sure to make a full backup of your device before heading to your appointment, because if your iPhone needs to be replaced, you’ll need a backup of your data to put on your new iPhone. Repairs at the Apple Store can be quite expensive if your phone is out of warranty. Fortunately, there are a number of third-party outfits that can swap your iPhone’s vibration motor on the cheap. My favorite alternative to the Apple Store is Puls, an in-person repair service that comes to you in as little as 30 minutes and offers a lifetime guarantee on parts and labor. Buzz Buzz! Buzz Buzz! Let’s Wrap It Up. Previous ArticleWhy Is Wi-Fi Grayed Out On My iPhone? Here’s The Real Fix! Next Article Siri Not Working On iPhone? Here’s The Real Fix!